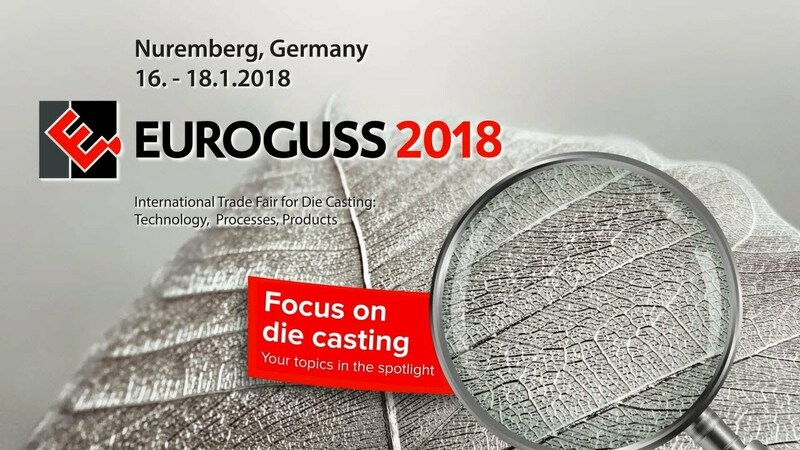 The die casting sector will gather in Nuremberg once again from 16 - 18 January 2018 for EUROGUSS, the trade fair that puts the spotlight on the entire die casting supply chain. Reap the benefits offered by this unique industry gathering and gain a comprehensive overview of all the opportunities and possibilities that the die casting industry provides. Around 600 international exhibitors from all over the world will showcase their solutions to meet the latest requirements of the die casting industry. At EUROGUSS 2018 you will meet operators of die casting foundries, manufacturers of die casting machines and equipment and exhibitors from areas such as die casting moulds, furnaces and accessories, alloys, after-treatment of castings, release agents and operating materials, rapid prototyping, materials testing and quality control. At EUROGUSS 2018 the trade fair is also accompanied by a diverse supporting programme: At the International German Die Casting Congress, experts present the latest advances in various applications that you can use to optimise your processes. Visit EUROGUSS, the only die casting trade fair in Europe, and experience innovations at first hand. Competitions and awards ceremonies show what's already feasible today, while interesting presentations venture a fascinating look into the future. Easily find what you're looking for – all exhibitors and products with their locations in the exhibition halls. We’ll keep you up-to-date with the latest information on what's happening in the market and in the exhibition halls. There are many ways to get to Nuremberg – whether you opt for car, train or plane, you can get here comfortably and inexpensively.